Bloomberg is the business community’s premier platform for information services, news and media. Through the BLOOMBERG PROFESSIONAL ANYWHERE® service, financial professionals can monitor the global markets and manage over-the-counter trades with live market data. 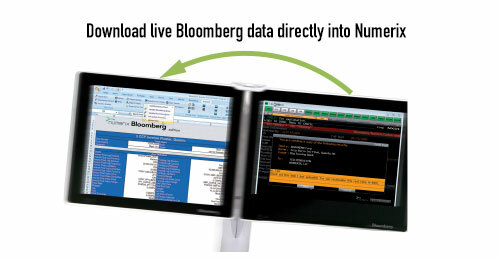 The strategic alliance between Numerix and Bloomberg enables Numerix Bloomberg Edition (NBE) users to access all of the benefits of Numerix CrossAsset—plus pre-integrated live Bloomberg data feeds. The relationship helps bridge the data and analytics gap for those companies that demand sophisticated, quantitative technologies and data to construct and price complex structures. With Numerix and Bloomberg, users can rapidly structure and value even the most bespoke deals, powered with live Bloomberg data. Users can also perform independent valuations based on market-standard models.